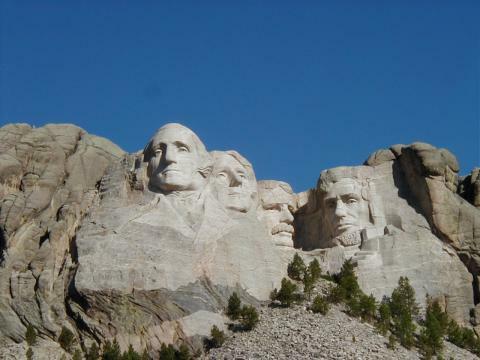 Once we arrived in South Dakota, we realized that Mount Rushmore is not open at night. So we ended up sleeping in a small town just a couple miles from the monument. Since it was after 4 in the morning, we figured that, for the first time on our trip, we would sleep in the car in a parking lot somewhere. We awoke four hours later refreshed and ready to continue. The last time we had been through the area it was foggy and we couldn't even see the tops of the mountains. But this time, Mount Rushmore was bathed in sunlight without a cloud in the sky. We finally got to see the first sight on our itinerary. After Rushmore, we had a very long drive ahead of us. On the way, we stopped at the Vivian Junction Restaurant and Lounge for lunch, where we ate bison burgers. 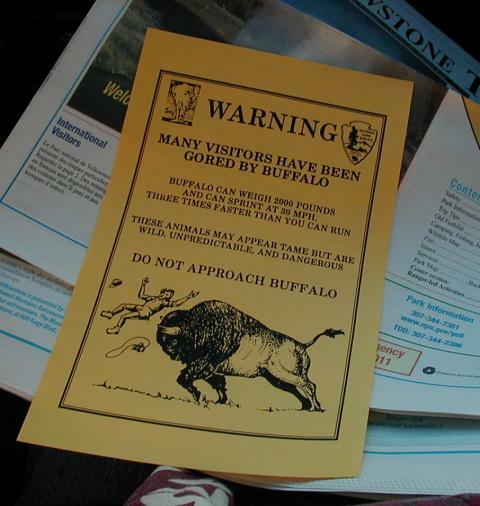 After successfully navigating Yellowstone National Park without being gored by a buffalo on day 4, we completed our victory over the buffalo by eating two thirds of a pound of genuine bison meat. It is supposed to be healthier than chicken, with very low cholesterol and low fat. In Fractional's words, "It tasted like a burger to me." 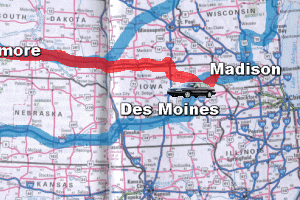 We drove on through the rest of South Dakota (which looked very much like it did when we drove through it two weeks ago), and through southern Minnesota, down to Waterloo, Iowa, where we stayed with Fractional's grandmother. After 39 hours in the car and assorted restaurants, we were overjoyed to sleep in real beds again.